AS its revenue hit a record high last year, Mitrajaya Holdings Bhd was navigating a cash squeeze. However, it sees the strain easing over the coming months. Its cash balances and deposits as at March 31, 2018, fell to RM12.4 million from RM25.76 million a year ago as operating cash flow remained negative for a fourth quarter over the past five consecutive quarters. Meantime, trade and other receivables swelled to an all-time high of RM593.6 million in the first quarter ended March 31, 2018 (1QFY2018). In a brief response to The Edge on the key challenges to collecting the receivables, Mitrajaya says accounts for some completed projects are still being finalised. The construction and property development firm further clarifies that of the RM593.6 million, amounts classified as retention sums totalled RM109 million. It is worth noting that Mitrajaya’s short-term trade and other payables stood at RM268.59 million as at March 31. Apart from trade receivables, also listed in its current assets were inventories for property development cost and completed properties, totalling RM307.13 million. In 1QFY2018, Mitrajaya recorded RM18.6 million in net profit, down 36.1% year on year as revenue slipped 9% to RM265.1 million due to lower contribution from its construction unit. The 1QFY2018 numbers represent an 8.9% pretax profit margin, smaller than the 12.9% seen in 1QFY2017. It is a slower start to the year compared with FY2017, which saw Mitrajaya break past the RM1 billion threshold in revenue for the first time, according to historical data compiled by Bloomberg. Construction remains Mitrajaya’s primary earnings driver, making up 85.4% of FY2017 revenue while property contributed 12.4%, according to Bloomberg. However, the FY2017 pre-tax income mix is more balanced, with property development making up 47.6% compared with construction’s 42.2%, based on Bloomberg data. Last year, Mitrajaya recorded RM1.16 billion revenue, up 20.5% y-o-y, although full-year net profit fell 32.3% y-o-y to RM80.4 million — the first annual profit decline since FY2012. FY2017 also saw Mitrajaya cut its net dividend per share to two sen, the lowest in four consecutive years. The estimated payout comes to RM17.91 million and it will be disbursed on Aug 2. “This year’s (FY2017) approximate payout ratio of 22% is slightly lower than the previous year’s ratio of 29% as the board decided to focus on future growth,” the company said in its latest annual report. Last Thursday, the stock was last traded at 47.5 sen per share, just a few sen higher than its multiple-year low of 45 sen seen in June. For perspective, the stock has not gone below 50 sen since October 2014. Over the past year, it has fallen by about 60.8%. Mitrajaya says among the key components eating away at its cash flow over the past 15 months has been the heavy capital expenditure on construction equipment between 2015 and 2017 that was financed via a two-year hire purchase arrangement. For that purpose, it had spent RM55 million in FY2015, RM78 million in FY2016 and RM25 million last year, for a total of RM158 million. According to Mitrajaya’s 2017 annual report released on April 30, the amount outstanding on hire purchase had been reduced to RM33.01 million as at Dec 31, 2017. It also reiterates that capex will be even lower this year as most of the construction machinery it needs for ongoing projects are now in place. “A substantial amount of the outstanding hire purchase will be fully settled progressively in FY2018,” the company tells The Edge. Another drain on its coffers in 2017 was acquisition of land that saw Mitrajaya pay RM60 million in cash that year. To recap, in February last year, Mitrajaya entered into a joint venture with Gema Padu Sdn Bhd (GPSB) to jointly develop three parcels of land in Selangor. The joint venture, 60% owned by Mitrajaya, acquired three parcels of land worth RM181.2 million from GPSB. However, part of Mitrajaya’s portion of the purchase price was offset against payments due from GPSB for previous construction work done, according to a previous Bursa Malaysia filing. Looking ahead, 2QFY18 ended June 30 may show signs that the strain on Mitrajaya’s cash flow is easing. Recall that on April 25, the company completed a one-for-five rights issue that aimed to raise funds to slash its borrowings. Note that managing director Tan Eng Piow, the company’s largest single shareholder with a 40.91% stake, subscribed to his entitlement in full. The only other substantial shareholder is the Employees Provident Fund with 6.27%. The exercise raised net proceeds of RM79.64 million that was used to repay borrowings, Mitrajaya confirms. On May 28, Mitrajaya gained another future cash boost — a RM13.3 million award as additional compensation for Johor’s compulsory acquisition of its 24.15 sq m land parcel in December 2016. It had appealed against the original acquisition price of RM31.5 million. As at March 31, the company had RM323.63 million in short-term borrowings and another RM40.59 million in long-term borrowings. A back-of-the-envelope calculation shows the repayment would reduce Mitrajaya’s gross gearing to 0.37 times, based on its balance sheet figures as at March 31. The company estimates the debt reduction would result in savings of about RM4 million in interest payments annually. 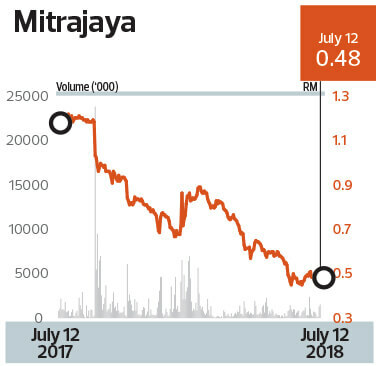 Mitrajaya’s close of 48 sen last Thursday was 59.92% lower than a year ago, giving it a market capitalisation of RM425.4 million.